The AHF series maximum flow air heaters are used with blowers or recirculating air in baking, drying, and preheating applications. This air heater is designed with a 23/8" O.D. aluminum tube and a cross frame heating element for minimum resistance to air flow. The nickel-chrome heating element is insulated by ceramic beads on a stainless steel support frame which is firmly secured to the inside of the tube. Post terminals enclosed in a junction box simplify the wiring. A four-inch round flange with pre-drilled holes at the inlet side are used for mounting the heater. It has a practical operating range of up to 200 CFM with temperatures up to 600 °F (315°C). Minimum flow rates are given in the table below. *These air heaters can be operated on either 120 or 240 Volts. Specifications are given for operation on both 120 and 240 Volts. **Indicates Watts per inch of heated length. Use the table above to determine minimum required flow rates. 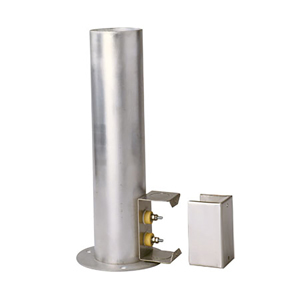 The Watts per inch of heated length can be changed by reducing the operating voltage or by ordering a custom made heater. Stainless steel construction also available. Consult Engineering.